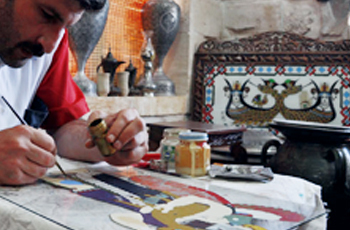 The copper plate was hand made by a master from Mardin, Ebu Burak (Tacettin Toparlı). 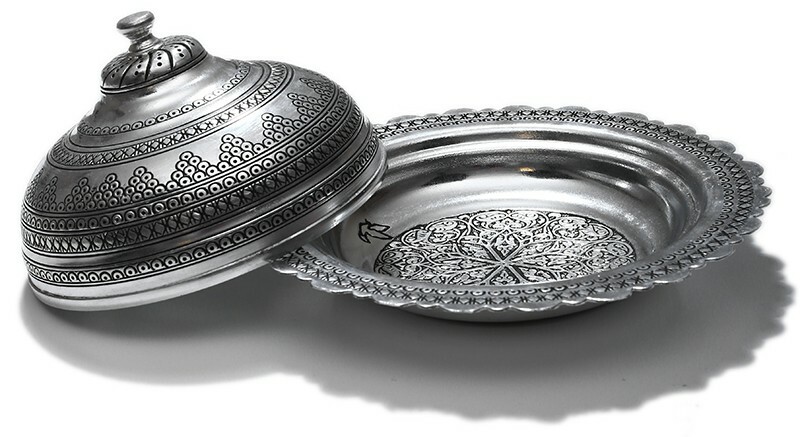 While the traditional grape patterns of Mardin region was used on the exterior part of the plate, the inner part of the plate was ornamented with the traditional bird patterns of Mardin. After the copper is annealed, it was given shape on a steel anvil by the help of a wooden mallet, and the ornaments were made by means of hammer and diamond pointed pen. 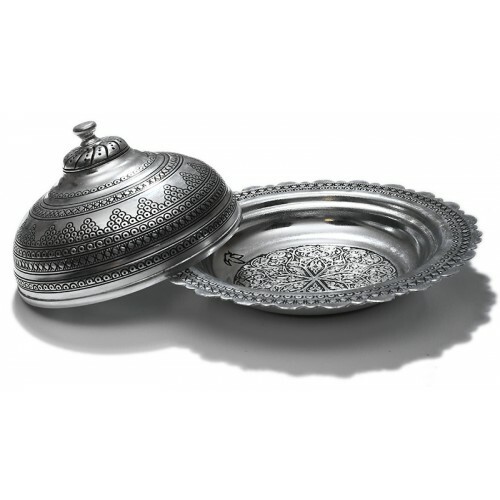 The copper plate was tin-coated by Hacı Davut. Master Tacettin who is also known as Ebu Burak by the people of Mardin was born in 21 November 1973 as the first of the six children of the family. Having learned the copper mastery from his grandfather and father by means of the mentor/apprentice system, his efforts towards surviving the Basilisk and glass-bottom art made him unique in this field. It wouldn’t be appropriate to continue without mentioning how the public artist met the bottom-glass art. In Mardin region, when a senior member of the family dies, the younger generation usually sells the belongings of the deceased, sometimes out of necessity, and sometimes due to their inability to look after these belongings. One day, Master Tacettin’s grandfather bought all the belongings of a family which lost its senior member. Among these belongings was a bottom-glass Basilisk which was common in every household and the grandfather hung it to the wall in his workplace, as there was already one hung on the wall of their house. Master Tacettin was 10 years old at those times. He explains his feelings when he first saw the Basilisk with these words: “I used to stand still in front of the Basilisk for 9 hours and it fascinated me”. When the Master asked his grandfather: “What is this grandpa? Everyone has something similar to this in their homes”, his grandfather briefly told him that Basilisk was the symbol of luck and prosperity. When he asked his grandfather if the Basilisk had a story, his grandfather’s answer was “I don’t know”. Master Tacettin continues: following this unsatisfying answer and with the curiosity and passion I felt towards an unknown mystery, I started to think about why a person would hang an unknown object on his wall”. The next day, he stood in front of the Basilisk and said: “What am I going to do with you?” He continues: “because of the Basilisk, the business went bad and I my father and grandfather were crossed with me. I tried hard to figure out how it is made and started to examine it thoroughly. At those times, it was hard to find brush, glass and paint. So I cut a piece of glass, put it on the Basilisk figure and started to draw. When I turned in inside out, I said to myself that I was capable of doing this job and left it on the floor. Then, I experienced a recession period and started to think about what I could do. At first, I had to break almost half of the pieces I made, which lasted for 6 months. I always felt that something was missing in the Basilisks I painted and I had some kind of dissatisfaction and a lack of contentment. Until my work took its final form, I ruined quite a number of glass pieces. At first, I gave away the glass bottoms I painted so as to survive the craftsmanship and the Basilisk legend. Nowadays, the setting I desired was formed and people started to buy Basilisks to their houses again”.